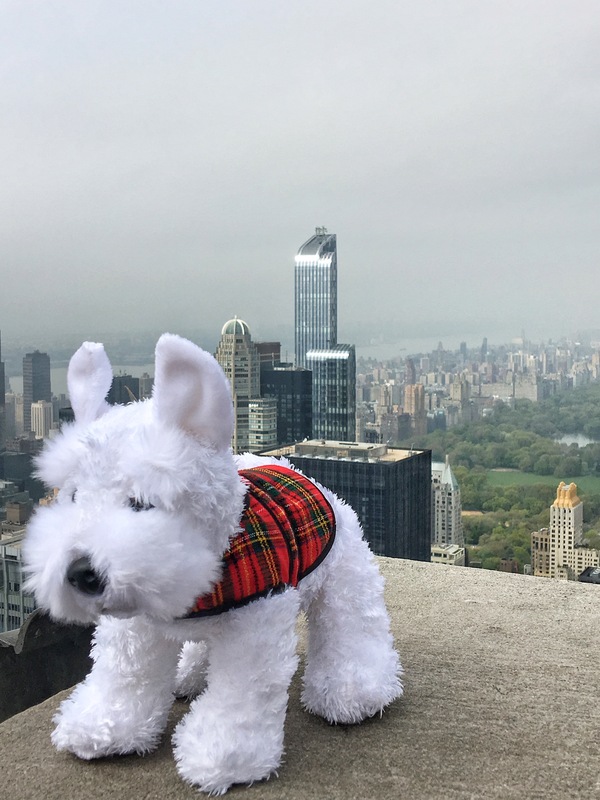 So, apparently some Wee White Dug imposter has been travelling around a place called the Big Apple and pretending to be me. I don’t even like apples, so I’d never visit a giant one. I like beefy treats, so the Big Beefy Treat sounds more like my kind of town. Funnily enough, Mum & Dad went to America recently and I think that’s where the apple place is so I suspect that they may have something to do with the imposter dug. Seems he caught a flight from Edinburgh Airport, which is very close to where I live. He flew to JFK with American Airlines, and I may be wrong but that looks very much like my Dad’s knee he’s sitting on, on the flight. While in New York he appears to have gone on a sightseeing frenzy. Anyone who knows me knows I wouldn’t go up that big building. There’s a big ape swiping aeroplanes at the top of it. He’s way too scary for me to want to meet him. The views look scary too and the street below is a looooooooong way down. Not content with just going up the Empire State Building, I apparently also went to the Top of the Rock or the Rockerfeller Center so I could look at it some more. That’s the imposter with the Empire State Building behind him. Underneath you can see Central Park in the view. The phoney Wee White Dug visited there too. Now that’s somewhere I think I’d like. Phoney me seemed to love it. Although, come to think of it maybe not. I watched a movie once about a wee boy who stayed all alone in a fancy hotel called The Plaza. These bad guys chased him in the park. I think they were called the Sticky Bandits. In another movie there was an evil wizard in there called Gargamel. He was trying to hurt some wee blue guys called Smurfs. Central Park probably isn’t for me after all. It seems the fake me covered a lot of ground in that Big Apple as he also took a boat ride to visit a huuuuuuuuge big green lady in the water, called Lady Liberty or the Statue of Liberty. She was a present from France. Boy they must have had to use an awful lot of wrapping paper on that present. She looks a bonnie big lass but there’s no way my wee legs would manage all of those stairs inside. I’m a bit scared of her anyway as in another movie I saw her walking through the streets of that Big Apple and it was full of ghosts. I’d have hidden. Mum and Dad are crazy, as they actually went to see where those Ghostbusters guys work. What if a ghost had escaped and got into Mum’s handbag and she brought it home with her? I must check in the closet and under the bed tonight just in case. Mum and Dad seem to like to put themselves at risk on holiday as they also went to the American Museum of Natural History where everything comes to life at night! Mum wanted to see Dum Dum, but she could have been chased by dinosaurs, marauding Huns or even slapped across the face by that aggressive monkey. The imposter visited some beautiful indoor palm trees at a winter garden and even met a gigantic rabbit. Rather him than me, as the more I see the scarier this apple place looks. Mum said near here is a very sad part of town, where a really bad thing happened and a lot of poor innocent people died. It made her cry when she visited. She said there are beautiful memorial pools now to remember the poor people who died, but some horrible tourists stand beside them smiling and snap photos of themselves with selfie sticks. Mum said those people have no respect and are called narcissists, which isn’t a very nice thing to be. I think if the real me went here I’d need sunglasses as it looks very bright – so many lights. If my big sister leaves a light on at home Mum always shouts “switch that light off, it’s like Blackpool in here” so this must be what Blackpool looks like. I’m not sure if Mum did any shouting about the lights here. As I said earlier, I think Mum and Dad were behind this fraud dug in the apple place but I can’t prove it. If they were I forgive them as when they came home to Scotland they took me on holiday to a beautiful place called Assynt. We had a wonderful time. I’ll get Mum to share those adventures with you shortly. 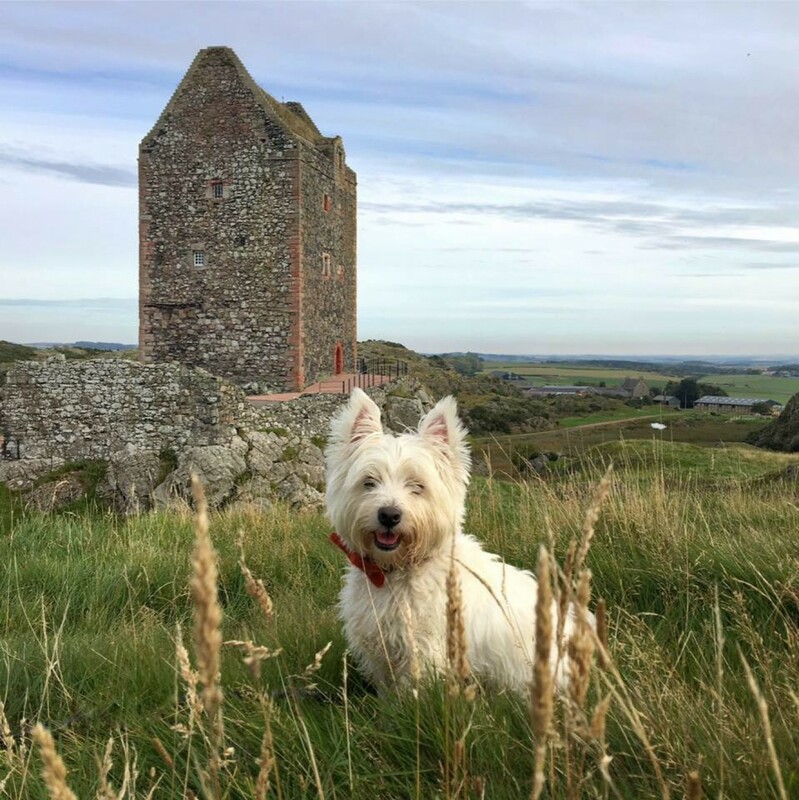 Normal service will resume shortly, and we’ll be back to being a dog friendly Scottish travel blog with the one and only Wee White Dug. Wee White Dug, I think you are very good at sniffing out the facts! Best that you stayed home and let them deal with all the noise and bright lights. As someone from the NY area intimately familiar with the city, and who was lucky enough to visit Edinburgh once, it’s interesting to see the reverse perspective. It looks like you had a great time, and hit all of the major sights. The narcissists you speak of down at the WTC struck a chord with me too. I remember that terrible day like it was yesterday; unfortunately the solemnity is lost on some people. Thank you – we adored New York, so much so that we came home and booked up again for the following year. We’re here right now and having a ball, although the narcissists are still out in force at the World Trade Center! I will never understand how anyone can pose smiling and unashamed at a mass murder site. It’s not just teens either but people who are older, look perfectly respectable and should know better. I despair of humans sometimes. Really loved this post, Casper you definitely are a clever and witty wee dug…your Mum and Dad are very lucky to have you take care of them. Ciao!!!! Love visiting New York City, the lights, the vibrancy, the shows and other performances. Living in rural Missouri is a blessing, but the big city is nice change of pace for a week or so. Wicked is definitely one of my favourite musicals. My two sons and i stumbled upon the Apollo Victoria walking back to our hotel in London and encouraged me to see it – i didn’t know what i was getting in for, but it was awesome! Phantom and Beauty in the Beast in NYC. Wicked and Lion King in London. Where do we find musicals in Edinburgh? Been twice – missed the theatre district i guess. Les Miz is one of my favourites, but haven’t seen it professionally done. I’m biased, but a local team, along with my 17 year old son, performed it in 8 performances – it was sold out every single night! they did a great job. anyway, next time i’m in Edinburgh (perhaps summer 2017), i’ll find a theatre – thank you! Brilliant! What a cute, original blog…and fab photos! Sorry the real wee dug missed all the cool places…but he’s probably glad he did! Love this, so funny. Casper, you’re a clever wee dug! !